Hello lovelies! I know a lot of you guys are interested in vegan, cruelty-free products and I myself am trying to use as many of these products as possible and to cut down on the products that don’t offer these elements. That’s why I try to feature as many cruelty-free, vegan and natural skincare and cosmetics brands as I can on my blog, as I think it’s important that they get the recognition they deserve, as well as to help all of you lovely lot when you’re looking foe suitable products, as I know it can often be difficult to find brands out there that are actually 100% vegan and cruelty-free. Disclaimer: items in this post were gifted to me for reviewing purposes. All opinions are 100% my own. So in today’s post, I’m going to introduce you to a fabulous skincare brand from Barcelona (queue Ed Sheeran’s song Barcelona), called Freshly Cosmetics. Freshly launched over here in the UK at the end of April,and are a well-known and well-loved Barcelona-based brand featuring natural face, skin and haircare products. The brand is known for being natural and kind to the planet (as well as to your skin), as their packaging is 100% reusable and recyclable. Currently, the UK sports the top 20 Freshly Cosmetics products, including their fabulous detox-plans and packs, as well as individual products like their shampoo and serum. Freshly Cosmetics products are made from high quality natural ingredients which are free from toxins, sulphates, parabens and all that nasty stuff. As said previously, their products are suitable for vegans and are cruelty-free, with reusable and recyclable packaging. If you would like to check out any of their products, visit freshlycosmetics.com/uk/. Now, on to the products that I received from a lovely PR contact. I was sent 2 of their products: the Detox Refreshing Shampoo (£13) and the Multi-Antioxidant Facial Moisturiser (£26). First of all, the packaging is so sleek and professional, I absolutely love it! 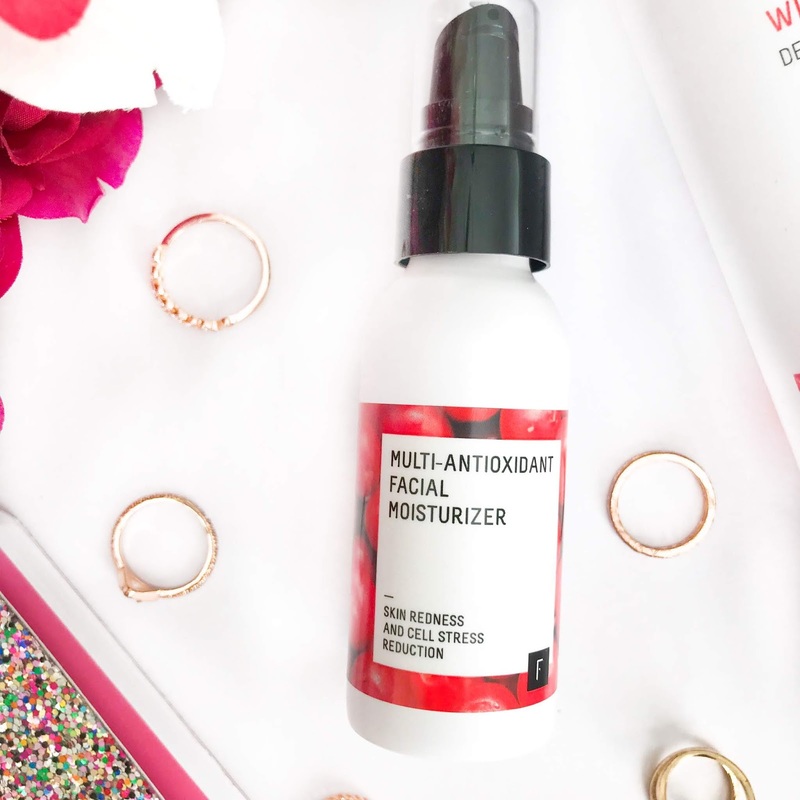 The first product I tried was the facial moisturiser, which claims to reduce redness and inflammation caused by psychological stress, as well as to increase skin hydration by 115%. It’s suitable for all (including sensitive) skin types and is non-comedogenic. The product has a light, botanical sort of smell which disappears once blended into the skin. I have extremely oily skin so I’m always wary of new moisturisers in case they aggravate this, but this moisturiser sinks in straight away, leaving my skin feeling fresh and matte but still hydrated. I’ve been using this on my cheeks because they tend to get the most redness (as well as my nose so I’ll have to try it out there! ), and it has definitely helped to reduce the redness. My cheeks are left feeling soft and supple all day long, wooo! I’m becoming a lover of hair products at the minute, especially vegan and cruelty-free ones, so I was super excited to receive this Detox Refreshing Shampoo. The product is scented with grapefruit, so you know it’s definitely living up to the Refreshing name! It’s both silicone and sulphate-free and claims to detoxify your hair, keeping it cleaner for longer, as well as strengthening roots and decreasing hair loss. I love the refreshing scent and the fact that it makes my hair feel super clean. It’s very light and suitable for sensitive skin. It does a really good job at cleansing my hair and lathers pretty quickly. After 2 washes, my hair is squeaking clean, which I love! All in all, I absolutely love the 2 products I tried from Freshly Cosmetics, and I really love the whole ethos of the brand. The products are beautiful, natural and cruelty-free and I love the reusable and recyclable packaging. If you’re looking for a new skin and haircare brand to try, I would definitely recommend checking out Freshly Cosmetics, especially their detox packs which you can get delivered straight to your door, as well as the lovely moisturiser and shampoo in this post! Have you tried any good cruelty-free brands recently? I love natural, CF products too and try to make it the focus on my blog. These products are right up my street and sound fab! I haven’t heard of this brand but definitely one to look out for. The packaging looks so nice and got me all curious about the brand! Loving the sound of that brand! I had never heard of it before! I would really need some new shampoo and moisturizer! I am really fascinated by the moisturizer because I have sensitive skin, which is occasionally oily so this is something I would buy. I hope Freshly Cosmetics sells in the US. Thanks for sharing!! I have read so many great things about Freshly but have yet to give them a try myself. They really do sound like great products. Thank you for sharing more cruelty free options on your blog. I love exploring new brands and products. Ooo, I hadn't heard of this brand before! Their packaging is so nice. I love the sound of the Multi-Antioxidant Facial Moisturiser. It sounds amazing! Would love to try that out. I'm trying to use more cruelty free make-up and skincare, too, and this brands sounds great! Especially the fact that their packaging is recyclable, that's such a bonus. I love the sound of the shampoo, I absolutely love grapefruit and I can imagine it would leave your hair smelling so good after using it! These products sound amazing! 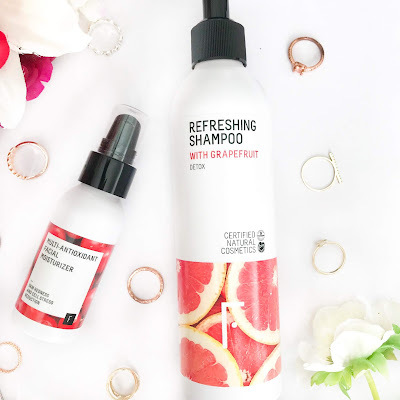 I love fresh, fruity scented products so grapefruit sounds amazing, I can almost smell it now! YES! I love that there are more brands getting on board with the cruelty-free products. Vegan is getting there too! I've never used Freshly Cosmetics before but love that they're affordable and does its job. Thanks for sharing these recs!